Helps sanitize and prevent growth of resistant microorganisms. Shocking or Super-Chlorinating spa or swim-spa water!!! Shocking or super-chlorination is the application of quick dissolving chlorine, with the intention of rapid increasing the spa's chlorine level. The reasons for shocking are due to the presence of microbial growth, cloudy water, underwater slimes and high levels of combined chlorine. This is done with a variety of products such as, dichlor, lithium hypochlorite, hydrogen peroxide or non-chlorine shock. Sanitizing is a must, for proper spa water management. Salt Chlorine generators are a better way to utilize chlorine, producing more controllable results. They eliminate the need to handle, measure or store chlorine products, while reducing buildup problems. Shocking can be a simple as changing the salt chlorine generator output to boost of shock mode. An Electronic PockeTester Kit is a convenient way to monitor the salt level, as well the overall water chemistry. How to shock treat a spa, swim spa or hot tub? Shocking a spa or hot tub refers to the application of large quantities of chlorine, non-chlorine shock or hydrogen peroxide. Typically 5-10 times the normal dose is used, based upon actual conditions and needs. The purpose of this large dose is to break down the combined chlorine, organic waste and contamination and re-establish a positive level of sanitizer. Shock treatments must be repeated, until such time as a stable sanitizer reading can be achieved, for at least a few hours. Products such as sodium dichlor, lithium hypochlorite and non-chlorine shock are used for this purpose, with spas utilizing chlorine, bromine, ozone generators, ultraviolet sanitizers, mineral sanitizers or ionizers. These products cannot be used in a biguanide-maintained spa: only concentrated hydrogen peroxide can be used as the shock. 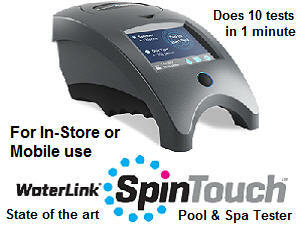 Spas using a salt chlorine generator can dial the output up to shock mode, to quickly super-chlorinate the spa. A spa should be shocked at the first signs of algae, mold or slime, after periods of heavy bather usage and at the onset of a loss of water clarity or quality. Another common practice is to shock treat the spa water every week, typically, after a period of high bather usage. This will help to re-establish the sanitizer level, help prevent the growth of resistant microorganisms and help maintain sparkling, crystal clear spa water. When using shock, the label doses are only a guide. Your spa or hot tub could require more or less, depending upon the actual water quality. If problems arise, refer to the Spa Problems Page, as a source of problem-solving information, broken down into various categories. Scroll down the page and click on the linked keywords, catch phrases or images, in the archived answers below, to access additional information, on that topic or product. ► When To Shock And Why? I just spent hours pouring through your website and it was so informative and helpful! I've bookmarked it for reference and will tell all my friends about it, for sure! I've read pretty much every answer you gave on the subject but still wanted some clarification, if you could: We just bought the "ChlorMaker Salt Chlorine Generator" as a cost effective replacement for our old Salt Water System Chlorine Generator, which never worked since we got it. We bought the tub used from a private owner and the salt system was a selling point. But, either we have broken wires or a need to replace the cell. And the Spa Mini is less than $200 instead of $700. The dealer that specializes in the OLD System told us, that we'd still need to Shock the tub weekly despite the generator. Your advice says that we should not need to shock it at all. That boosting it for high usage should do the trick. You did allude though that there might be "some times where you might need to shock it" but did not describe what those might be. We don't really trust the dealer who is trying to sell us extra things. So what I really want to know is, WHEN are the circumstances we would need to use a Shock treatment? If I need to have some on hand, that's fine, I just want to be able to recognize the circumstances we would need to use it and would love to avoid it all together if it's just something they told us to sell more products. I know all about balancing the other aspects of the water. We have already been doing that, while adding chorine shock once or twice a week, until we decided what to do about replacing the salt chlorine generator. Plus all the info on your site informed me EVEN better than I was before. Thanks for your help! You may never have to shock the spa, with a salt chlorine generator. BUT!!! There could be times when the bather usage depletes the free chlorine level. Salt chlorine generators do not always play catch up very well, so adding some shock could avoid a problem. Otherwise, once a month, even if all is well, raise the free chlorine to 5-10- PPM. This helps eliminate any microorganisms that might become resistant to normal levels of chlorine. Any time you see a loss of water quality is a good time to test the chemistry and possibly add some shock. The great thing about salt chlorine generators is that you can simply dial-up the chlorine output and create the same effect, as a shock treatment. If you need a quick boost, then a chlorine shock is the way to go. I hope that the information provided was helpful. Best wishes for the new year. ► How Much Shock To Add? Hello, I can’t seem I to get an answer to this question. My hot tub is 72 in x 72 in x 30 in deep. How much shock do I use. Thanks. The amount is enough. Every spa is different and size is not the only consideration. Read the label and add that amount. Retest in an hour and add more, if necessary. Keep adding, until the water clears up, the underwater surfaces are not slippery and the free chlorine is a stable 1-3 PPM. The total chlorine should not read more than 0.3 PPM. If it does, more chlorine has to be added. Make sure the pH is 7.2-7.6. 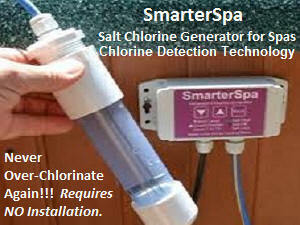 A salt chlorine generator is a convenient way to add chlorine and eliminate most needs to shock a spa. You can simply dial-up the chlorine production, on a temporary basis. 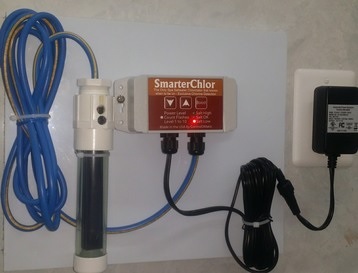 The SmarterSpa model knows when to produce chlorine and when to shut itself off, preventing over-chlorination. There are no-installation required models, starting at very affordable prices. It will eliminate the need to measure, handle and store chlorine and help eliminate most odors. I hope that I have been helpful. If so, please tell your friends about the website. Best wishes for the New Year. ► Chlorine Shock And Bromine? If I am using Bromine, should I use a non-chlorine shock treatment and would anything negative happen if I used a chlorine shock? This past summer, I only used non-chlorine shock and had beautiful water. Last week, the pool dealership gave me a fast-shock that has chlorine in it. Is it safe to use with Bromine or not? Thanks. Using the chlorine shock should not be a problem. When you add a non-chlorine shock to bromine maintained water it destroys contamination or converts into bromine. Guess what? The same thing will happen, if you use chlorine. It all ends up as bromine. Isn't chemistry great! I assume that the product is sodium dichlor and it should provide equally good results. There would not be a problem switching back at any time. Just get yourself a good, easy-to-use, water analyzer, such as the ColorQ PRO 7 Digital Water Tester. It eliminates all color-matching and guesswork. Enjoy the spa. ► Something Other Than MPS? I think I'm allergic to non-chlorine shock and my wife doesn't want to use chlorine in our indoor spa because of the odor. Can I use a Bromine system and shock with something other than mps? Or what else would you suggest? Thanks. If you are maintaining your spa on bromine, excess mps will convert to bromine. You can shock with chlorine. There should be little persistent chlorine odor, as it will be converted into bromine. I am not sure if your are allergic or not. The problem may be rooted in poor sanitation and not have anything to do with bromine or mps. I certainly agree that avoiding chlorine would be best, in terms of the odor. What I suggest is that you add an ozonator. This will allow you to avoiding using shock, under normal conditions. In addition to the ozonator, you should maintain a 1-3 PPM level of bromine and use a mineral sanitizer, to help maintain this lower level of bromine. Either way you should get better water quality with less odor and fewer chemicals being added. A Salt Chlorine Generator has become a popular option, as it is the better way to do chlorine. Affordably-priced models are available, that require no installation. Simply Plug-n-Play. I hope that I have been helpful. Good luck and enjoy the spa. ► How Often To Shock? My spa is maintained with granular dichlor. Do I still have to shock the water? Shocking helps to destroy organic byproducts and wastes and helps prevent the development of resistant microorganisms. Shock treating the spa water, once a week or at the first signs of a loss of water quality, is a reasonable minimum. You could use the same dichlor product to shock: just add a double or triple dose. I would prefer to use a non-chlorine shock. This product will help destroy the odorous chloramines and get you back into the spa even sooner. If your spa is equipped with an ozonator, the need to shock treat a spa can be reduced, especially if the ozonator is run off a separate low-speed pump. I hope that I have been helpful. ► To Shock Or Not To Shock? Thanks for your web site, I find it very helpful. I have a spa that is 300 gallons. I run 6 days a week and get in the hot tub after my run. This obviously takes its toll on the water chemistry. Do you have any suggestions as to how often I should shock and how often I should change the water? Any thing else you think I should consider? All that activity is going to add a lot of wastes to the water. A salt chlorine generator is a convenient way to add chlorine and elimina te most needs to shock a spa. You can simply dial-up the chlorine production, on a temporary basis. The SmarterChlor and MegaChlor-CD models know when to produce chlorine and when to shut itself off, preventing over-chlorination. Both models allow you to set in boost mode, which super-chlorinates the water. Doing this could help reduce the need frequent shock treatment. However, a weekly shock treatment is still useful to rid the water of wastes and help prevent the development of sanitizer-resistant microorganisms. How often to change the water can be subjective. The only scientific way would be to measure the TDS. If it rises 1500 PPM above the starting point, without a doubt the water should be changed. Every 3 months is a common guideline, but heavy use could mean more frequent changes. A lot depends upon the sanitizer being used. Some methods add a lot to the TDS. Ozonation does not. The important thing to do is maintain the water chemistry and clarity and it is the best indication of water quality. I hope that I have been helpful. Why do I need to shock my spa when it has an ozonator and I add chlorine daily? You may not have to. But, that doesn't mean that you shouldn't! Once in a while it is a good practice to shock the spa, in order to not only destroy organic contamination, but to eliminate microorganisms that might have able to survive more typical chlorine levels. There is no set rule and every spa is different. If the spa is not going to be used for a few days, that is always a good time, as it will not interfere with the use of the spa. You can further reduce the need to shock, by adding a mineral sanitizer. I hope that this information is helpful. ► Choosing A Spa Shock Treatment? I'm an owner of a new spa. I've got the water chemistry all balanced. Everything's cool, but I was wondering about something. I'm using bromine as a sanitizer. I buy shock made for the spa which costs about 6 dollars a pound. Is it the same as the 1 pound chlorine shock bags that I use in my swimming pool? If not, could I use this as shock for my spa? I'm kind of confused about whether chlorine is the sanitizer used in spa shock, or not. Thanks in advance. Chlorine could very well be the active ingredient in the spa shock that you are using. Because you are on bromine, any chlorine or non- chlorine shock will be converted into bromine. Isn't chemistry great! The pool shock in a bag is most likely calcium hypochlorite: you should not use this product in the spa, as it is slow dissolving, will raise the pH and contributes calcium to the water. The product that you are using probably contains sodium dichlor: it is quick dissolving, essentially pH neutral and well suited for spa shock treatment. Another good choice would be potassium peroxymonosulfate: a non-chlorine oxidizer that will quickly boost the bromine level and is completely soluble. You could meet all the sanitizing and shock requirements, by adding a salt chlorine generator. Shocking can be as simple, as changing a setting, on the controller. It provides more consistent and better results. I hope that I cleared things up for you. Enjoy the spa. I have a question about the use of hydrogen peroxide in spas. Some friends of mine are using straight hydrogen peroxide in their spas and they say it works great. They have no way to test how much is required to do the necessary sanitizing but they say they just add lots and it won't hurt you. This is obviously bucket chemistry, but I do not have any knowledge about hydrogen peroxide to discuss with them. Can you tell me about this stuff or tell me where I can go to get this information? Thanks. The lack of specific information about hydrogen peroxide is probably due to the fact that the material is not recognized as a spa sanitizer. It is used as a spa oxidizer, usually in conjunction with biguanide. There is no doubt that it is an effective oxidizer. I would not recommend its use in a stand alone situation. If you want to totally eliminate chlorine or bromine, hydrogen peroxide can be used in conjunction with a mineral sanitizer. The mineral sanitizer will help provide sanitizing action and the hydrogen peroxide will furnish the necessary oxidizing action. It is possible to test the peroxide level: LaMotte Company produces a convenient Peroxide test strip. Have you considered a salt chlorine generator? It is a complete sanitizing system, which can be used to provide oxidizing action and will avoid handling the hazardous hydrogen peroxide solution. I hope that this information proves helpful. ► Shocking A Biguanide Spa? Can a non-chlorine shock be used in a spa being maintained with biguanide? I use hydrogen peroxide now, but would like to use something else. Thanks. Non-chlorine shock is potassium peroxymonosulfate. It cannot be used with biguanide as a spa shock treatment or for any other reason. Non-chlorine shock will chemically destroy the biguanide. Hydrogen peroxide is the product of choice. The track record on biguanide suggests, that sooner or later, you will have to switch to another sanitizer, because of the development of sanitizer resistant mold and bacteria. A salt chlorine generator is a complete sanitizing system, that can provide better and more consistent results, at a lower cost. Enjoy the spa experience. 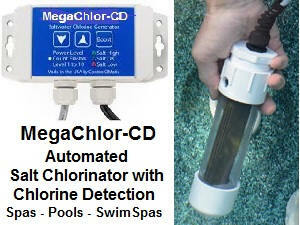 ► Using Chlorine Or Non-Chlorine Shock? Thank you for your informative website. I am a new spa owner and have decided to go with sodium dichlor, as a sanitizer. But, after reading a lot on the internet, I'm still confused. Should I use a chlorine or non chlorine shock with this? Why would I choose one over the other? I guess I just don't get the difference, especially when using chlorine as the sanitizer. Thank you for your time. You can use either one. The purpose is to maintain a free chlorine level of 1-3 PPM, with the total chlorine not more than 0.3 PPM higher. If the total chlorine gets to be too high, the non-chlorine might do a better job of narrowing the difference. If you opt to go with a salt chlorine generator, you will have a complete system, which sanitize the water and provide the opportunity to shock, simply by changing a setting. We offer several models, that require no installation and two of the are "smart enough", to only produce chlorine, when it is actually needed. You'll never over-chlorinate again. I hope that you will find this information helpful. Hi Alan, I just bought a house with a hot tub and have many questions about water chemistry. I have found your web site very helpful and have put it in my favourites. One quick question. Is there a maximum amount of shock treatments you can do in a week? Is it dangerous doing it too often? Are shock treatments harmful to the tub or my family? I am using bromine and it seems that shock is the only thing that brings the levels back up. The shock is a lithium based granule. The questions could keep coming , so I will go back to your site and wait for your response. Thanks for your help and your web site info! Sincerely. You can shock treat your spa, as often as needed, to maintain a 3-5 PPM level of bromine. Shock treating merely refers to the addition of a quick dissolving product that will provide an instant boost to the bromine level of the spa water. You can use the current product or sodium dichlor or a non-chlorine shock for this purpose. The bromine product is slow dissolving and the easiest way to boost the level is to add "shock." I hope that I have been helpful. I shocked my bromine spa last night, and tested it this morning. My pH is at 8.4 and my bromine level is way too high! After shocking, are the levels supposed to go back down to where they were by themselves, or do I have to re-adjust everything all over again? I had all my levels perfect, and now they're all too high (except for the TA - that is still good). Thank you. Not really! An ideal bromine reading should be 3-5 PPM. Higher levels could be irritating. If the water was "perfect" adding shock would have boosted the bromine level. The water being in good condition probably did not have a lot of wastes and byproducts present that would react with bromine. It may take a few days for the levels to drop and I would not recommend bathing, unless you know how high is high. In the future, remember you can always add more - you can't take out! Add shock treatment in increments until the level is 5-10 PPM, instead of adding a fixed amount and, possibly, overdosing. If you want to lower the level quickly, many dealers carry a chlorine/bromine neutralizer product. Follow directions and add it increments. Your pH is too high and should be lowered to the 7.2-7.8 range. I hope that the information proves helpful. I am using bromine tablets in my hot tub. I work hard at keep the level in the 3-5 PPM and the water seems to be in excellent shape. Do I still need to shock? Good question! If you add a spa shock treatment, such as a non-chlorine shock, on a weekly basis or after heavy bather usage or at the first signs of a loss of water quality, you will help destroy the buildup of organic byproducts and help prevent the development of resistant microorganisms. On the other hand, if you rarely shock the water, you increase the likelihood of organic byproducts building up and the development of resistant microorganisms. At the very least, consider adding some non-chlorine shock after periods of heavy usage, in order to quickly re-established the bromine level. A reliable tester can help speed the process. The ColorQ testers are all-digital and eliminate the color matching and guesswork. I hope that I have been helpful.